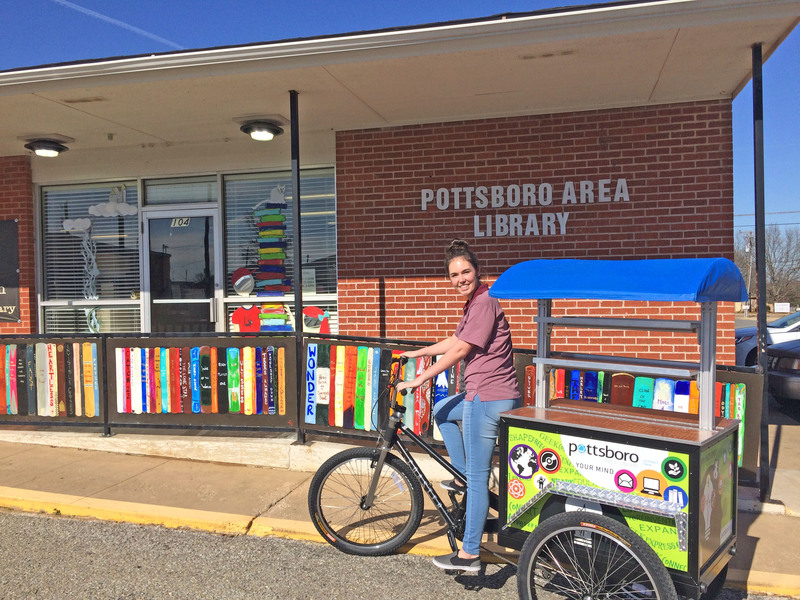 The Pottsboro Area Library has a new way of getting books in the hands of its community members. Working with Coaster Cycles to develop their “books on wheels” concept the Coaster Mobile Library is sure to be a hit. KXII Fox News 12 was there to cover the maiden voyage Pottsboro’s Books on Wheels. Built on our Mini Cargo chassis gives this Bike the tough and rugged foundation that Coaster is know for. Ready for years of heavy use with no detail being over looked. Offering ample internal storage, a collapsible/removable awning, and modular shelving there is no limit to the adventure that this library on wheels can deliver. For those of you with an abundance of knowledge to share rest assured, the Coaster Mobile Library is available in a full size version as well. This provides the same top quality and rugged construction but with nearly double the storage and shelf space. Please CONTACT US for more information on how to get a Coaster Mobil Library to a library near you!